We're still trying to decide what to do Easter weekend. 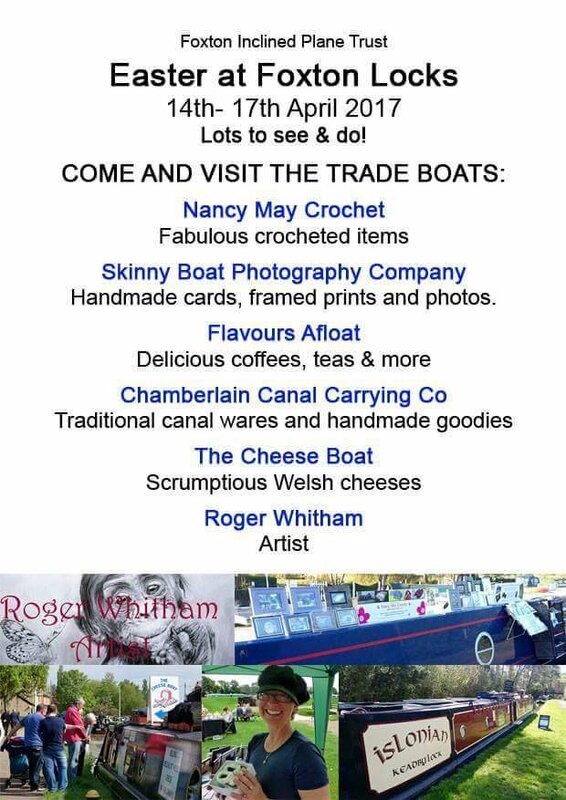 We definitely want to attend a boaty event - on the list at the moment is Ellesmere Port or Foxton Locks - both of which are being attended by good friends. Anything else going on? You have got me confused Ange, as the main Foxton Locks festival is not until 17th / 18th June - hardly Easter. Is there a different event there to the main summer festival? For the Easter weekend Ellesmere port is simply too far for us by boat at the moment, but we are currently at Radford on the GU, heading for the BCN. We will be attending the HNBC Easter gathering at Brownhills on the Wyrley & Essington. Richard & Sue have had to pull out of the Port, but have suggested they may pay us a visit at Brownhills. This was on Facebook. I wasn't aware Richard and Sue weren't doing Ellesmere (they were the friends i was referring to) - Brownhills is an idea - we might see you there. Looks like a kind of "floating market" type event, though perhaps not many traders, by the look of it. However I note Paddy and Ruth are included in the list. We hope to do the Foxton Locks Festival later in the year. "Nancy may crochet" - depending on what mood she's in? To be honest, I'm not that impressed with fliers that say "lots to see and do" but give almost no clue whatsoever what that is supposed to mean. It does look rather like it would be a busy gongoozler day at Foxton anyway, and there just happen to be a cluster of trading boats present. If it's more than that, why not say so? I wonder if one could substitute "buy" for "do". Visitors can take home a water can, a picture of a monkey and half a pound of Caerphilly. But, as you suggest, the locks on a Bank Holiday should offer a lively and enjoyable scene anyway. Ellesmere Port is looking like it's going to be a good event this year. Plenty of boats starting to form up around Cheshire. Daniel Adamson will be there which in my book is worth the trip alone. For a reasonable fee you can have a 90 min cruise on board up the MSC. There is the Idle Women theatre thingy going on too, and none of that god awful sea singing stuff of recent years.